How to stamp PDF with image? To protect PDF document from being used unauthorized, you’d better stamp PDF document with the help of VeryPDF PDF Stamp which is a powerful application for stamping PDF with images, text, graphic lines and rectangles. With stamp creator, you can annotate your PDF with custom stamps. 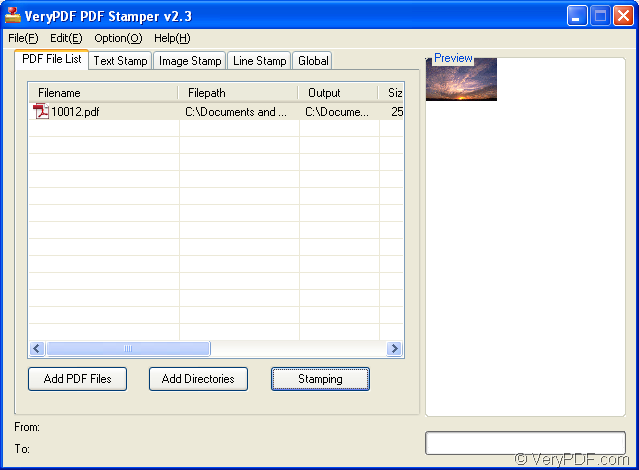 To use this easy application, please free download VeryPDF PDF Stamp and install on your computer. When opening PDF Stamp, you can see its user interface and will quickly be able to know how to use it. Please follow the steps shown below to stamp your PDF document with image. 1. Please click PDF File List tab and then click Add PDF Files button to choose PDF document from the popup file picker window. If you need to remove the added PDF document from the file list, please right click the selected PDF and then choose Delete Selected Items in popup floating item or you can click Clear All Items to clear the file list. Please see it in the next snapshot. 2. 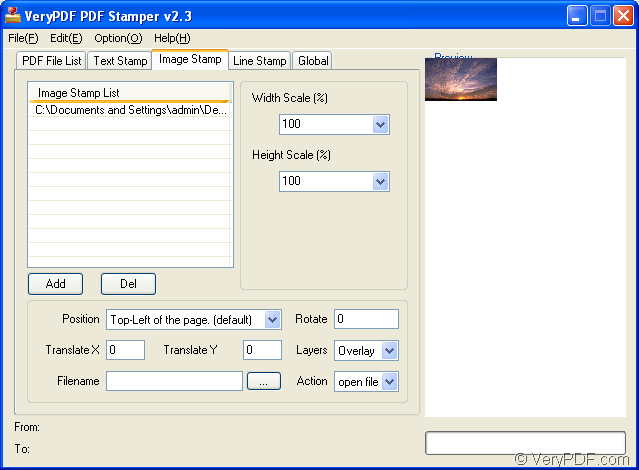 Then please click Image Stamp tab and click Add button to choose the image that you want to use for stamping PDF in popup file picker window. To delete the added image, please click Del button. In Width and Height Scale dropdown list, you can set the scale percentage for stamped image. In Position dropdown list, you can choose the location for the stamp on PDF page. In Rotate edit box, you are allowed to input the rotation angle for PDF stamp. In Translate X and Y edit boxes, you can set the accurate location for the stamp. In addition, the image stamp can be linked to some URL, some page of the PDF or some local file in Action dropdown list and Filename edit box. Please see it in the next snapshot. 3. Please click PDF File List tab and then click Stamping button to start to stamp the PDF document. In the popup saving window, please choose an output location and input the file name for the stamped PDF document. In order to learn more information this application, please visit the homepage of VeryPDF PDF Stamp. 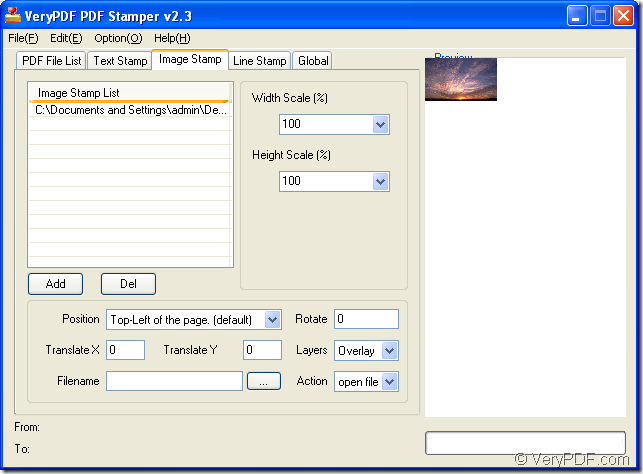 Click the following button, you are able to download the free trial version of VeryPDF PDF Stamp. How to stamp and sign a PDF already signed without invalidating previous signature? How to add page numbers to PDF from PHP code? This entry was posted in PDF Stamp and tagged stamp PDF. Bookmark the permalink.